Bought the legs from Osbornewood. 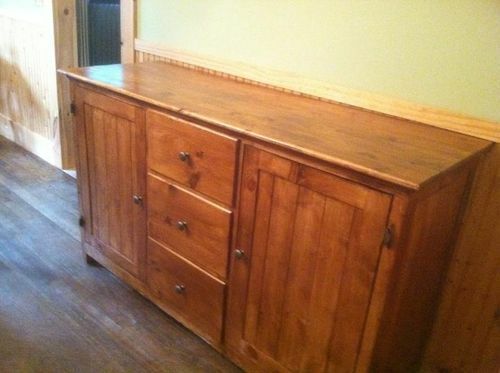 Made similar to a table the wife saw at Pottery Barn, though adjusted the demensions and added a drawer. It’s made of cheap white board (I’m assuming Pine) from Lowes. I’ll wait to invest in more expensive woods until I know what I’m doing. The finish was minwax provencial which i then sanded and toped with english walnut, then two coats of dansih oil, then 2 of poly. still thinking of adding the minwax finishing paste wax to the legs to try and bring up a sheen. All in all, a good learning experience! Looks good Tom. And Welcome to LJs ! Welcome to Ljs ,nice work. Thanks everyone. I’m new to woodworking but gotta say i love this site. A lot of your ideas and creations are a real inspiration. I did a Pottery Barn knock off too. Built a dinning room buffet. I refuse to pay Pottery Barn prices when I can make it. -- Liberalism... Ideas so good, they have to be mandatory. Wow, looks great. How did you join the top and bottom to the legs? Thanks. I just used pocket screws.